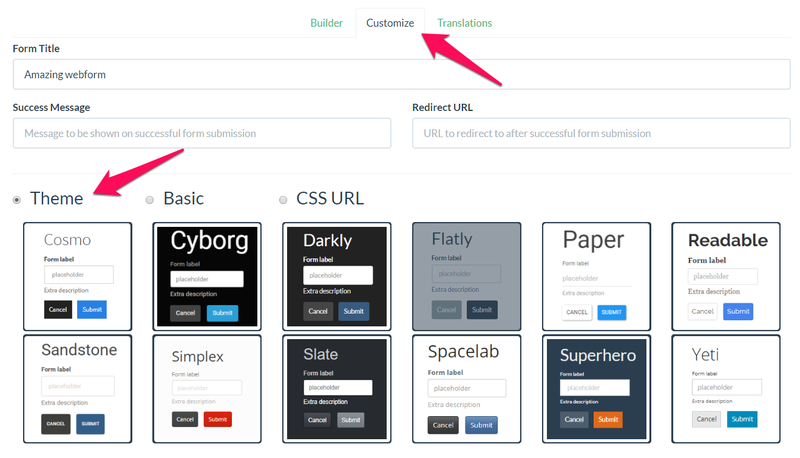 Momentum offers the most advanced Form Designer to create gorgeous, mobile-ready custom form themes. It's easy to add section titles and images, experiment with different fonts and colors, and design a form that fits your needs. The theme option allows you to choose a modern and responsive template from bootswatch.com. The theme Flatly will be chosen by default. Via the Preview button you can see how the selected theme changes the lay-out of your form. The basic option allows you to change a few basic styling parameters to update the font and colors. Note: These changes will be applied on top of the chosen theme. The CSS URL option allows you to do some more advanced stuff. You can either provide a link to your CSS file (or select one yourself from bootswatch.com). In the 2nd text box you can enter your own CSS code to overwrite the attributes of your CSS file.